Rekordér, sampler a kontrolér v jednom vychádza zo Zoomu R24. Nahrávanie na 2 stopy súčasne, prehrávanie až 8 stôp, zabudovaný stereo mikrofon, DSP efektový procesor, ladička, metronóm, podpora SDHC kariet do kapacity 32GB, USB 2.0. The Total Music Production Solution... Just Got Smaller. Zoom takes the turbocharged design of the R24 and scales it down for an ultra-portable music production solution. Like its predecessor, the R8 combines four production tools in one versatile device. In addition to being an 8-track recorder that utilizes SD memory, the R8 is an audio interface, a control surface and a pad sampler. With the ability to record two tracks simultaneously, the R8 is perfect for capturing audio on-the-go. Record live music performances, rehearsals, songwriting sessions or even audio for film and video. Capture your audio at up to 24-bit/48kHz resolution as WAV files. On each of its side panels, the R8 features a built-in stereo condenser microphone for field recording or quick, convenient “sketch-pad” ideas. When you're ready, you can use over 140 built-in studio effects to enhance your tracks and the pro-quality mastering effects to ensure that studio sound. The R8 is more than a multi-track recorder. When combined with your compute, it becomes a powerful audio interface. Connect the R8 to your computer via USB, launch your favoriteDAW or use the included Cubase LE software and start laying down your tracks. Simultaneous 2-in/2-out capability allows you to record up to 24-bit/96kHz high-definition audio. If you use the 44.1kHz sampling rate, the internal DSP effects of the R8 are also available for your computer tracks. A dedicated control lets you adjust the mixing balance between the DAW playback sound and the direct sound for monitoring. 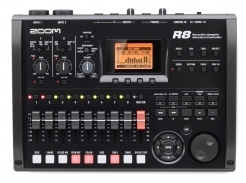 The R8's sampler function consists of eight voices triggered by eight built-in pads. Samples can also be assigned to each pad to create loops. It also has internal drum loops, which allow you to easily create pro-quality backing and basic tracks. Not only does the R8 offer over 500 drum patterns to work with, it also includes a 2GB SD card containing 500MB of drum loops recorded by Big Fish Audio. Best of all, the R8 will operate on four standard AA alkaline batteries (not included) for over five hours of continuous use. In addition, the R8 comes with a 2GB SD card and supports up to 32GB SDHC cards for a maximum of 100 track hours. Using SD media for recording not only makes the R8 lighter and more portable, it also ensures increased reliability with no concern for hard drive failure. The R8 can also function under USB bus power or with the included AC adapter.